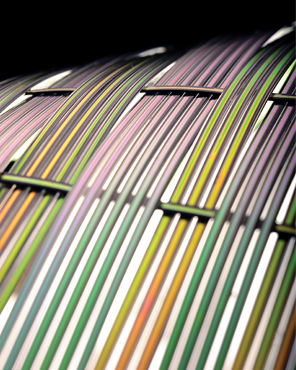 Small fiber-optic wires carry light signals to devices carved with nanoscale ridges that convert the light into sound. See Zheng Wang present his work at our EmTech conference. Light beams are so fast that using them to replace electrons would make for vastly more powerful and energy-efficient chips, even paving the way for quantum computing. At times, though, light is too fast. That’s why Zheng Wang decided to slow it down. “The speed is very good for optical communications but very bad for processing signals on-chip,” he says. To slow light, Wang, an assistant professor of electrical and computer engineering at the University of Texas at Austin, created nanometer-­size ridges on a chip. The ridges are so slender and flexible that they can be deformed by electric fields. When light is delivered by optic wire to the ridges at the edge of the chip, they convert the light waves to high-frequency sound waves, which travel at about a hundred-thousandth the speed of light. The same trick works in reverse after the sound waves have traversed the chip, with the ridges converting the sound back into light to continue its higher-speed journey via optic wire. Other researchers had accomplished similar feats with light—but only by enlisting a high-powered pulse laser that generates acoustic pulses, a much less efficient and larger-scale process that can’t be handled on a chip. Sound waves are much easier to read and route within the tiny confines of a chip. And they offer the huge advantage of not generating the heat that electronics do. That makes Wang’s approach promising for applications in information processing, as well as in nanoscale microscopy.